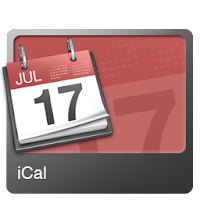 iCal, the popular Apple calendar has a lot of power that can be used to get your life organized. While some disagree, most Apple users believe that iCal is an invaluable resource for keeping their lives organized and running on schedule. Here are 10 essential iCal tips and tricks that you should know. Change the default event duration - By default every event in iCal is created as lasting one hour. You can change this so you don’t have to manually change every entry you make. Just a simple command typed into terminal can do the trick. Resolve issues with stuck iCal updates - Uncheck and then recheck the calendar display option box and you can relieve yourself of those painful 1000% resource utilizations when the updates don’t work. Integrate iCal with Kinkless GTD - Organize tasks by metagroups, and more using serious getting things done principles. Open files on schedule - iCal can be used to open a file at a scheduled date and time. Have you thought about writing an Applescript and letting iCal open it? Use this to play music, load web pages, or run complex batch routines. Use the keyboard shortcut Command+E to go straight to an editable window - You can also edit an event without the popup. All you have to do is select the event, press Enter and start typing. You can even change your titles to three lines of text by pressing Option +Enter. Another tip is to realize that event popup windows are movable. This is especially important when the window blocks important information on your screen. Just click the popup and drag it out of the way. Set multiple alarms for a single event - This is handy when you have something important to do and you want to make sure you don’t miss it. In the event’s Info panel, click “Alarm” and you will see a menu for adding alarms. You can even set alarms to go off after the event. This can be used to remind you to clean up following an event or a variety of other situations. Explore Easter eggs -Easter eggs are cool hidden features within a program that can include commands, a credits list, and animations. Print to do lists directly from iCal - Click on File and then Print (or press Command + P). To print a list, change the View field to List from Month and uncheck all the options except for To Dos. Migrate from Outlook to iCal - If you’ve wanted to switch over to iCal but didn’t want to re-key your data, there’s a way to do it. Using Palm Desktop as an intermediary, the process that once seemed impossible becomes quite easy. Customize the alarm message - In just a few steps you can customize the alarm message in iCal. The process involves creating a .mov and replacing a file in your iCal installation. Go ahead and give these tips a try. You will be surprised at how much you will learn just by checking out the links, exploring iCal, and doing things just a little bit differently to squeeze even more out of iCal. Caution: once you begin tweaking iCal it’s hard to stop. iCal quickly becomes addictive. The guest author, James Adams, is a writer and designer working for Cartridge Save where he reviews products such as the HP 21 ink cartridge.